Average Height	: 24" - 25"
The first strains of setters were developed in France in 1500, obtained from the Spanish pointer and the French pointer. These early setters were called "Setting Spaniels," named after the way they would crouch down after finding the pray to allow the hunter to throw a net over it. In the early 1800s they were brought to Great Britain where a breeder named Sir Edward Laverack developed them into the English Setter we know today using early French hunting dogs. He bred out the trait of crouching down more to an almost sitting stance, so the dogs would be easier seen by the hunters who now had guns. 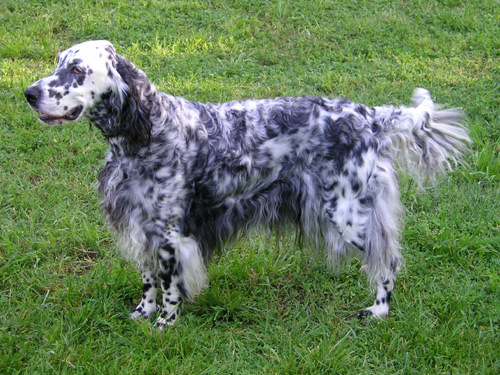 The English Setter is often called the Laverack Setter. The word "setter" comes from the way the dogs appear to almost be sitting down when they discover game. Laverack's dogs are the foundation stock for many of today's top show dogs. The Llewellin Setter was bred out of English Setter lines by an English breeder named Llewellin. The English Setter's talents include hunting, tracking, retrieving, pointing, watchdog and agility. However, as useful as a net is for hunting purposes, a rifled gun is more useful still--and the old Spaniel "pointers" were becoming quickly obsolete as gun hunting became more common in the early 19th century. Thanks to the efforts of two gentleman breeders--Laverack and Llewellyn, who lend their names to the two variants of the general English Setter--the modern upright setter was created through selective breeding. The Laverack Setter was created more for attractiveness and genetic purity, making the Laverack variant of the English Setter breed more common in show rings, while the Llewellyn Setter was created more for simple hunting efficiency and power, making the Llewellyn variant of the English Setter more common in the open country, staring down a fat grouse and waiting for his master to arrive with the rifle and the reward. The English Setter is an energetic, outdoorsy dog whose greatest joy is simply to expend its energy. Any Setter owner will need to have a large, fenced yard (or other adequate outdoor space) and the willingness to spend hours every day walking, jogging with, and otherwise exercising the English Setter. This native companionableness may seem surprising, considering the Setter's independent hunting style. But the Setter is one of the more friendly and needy dogs out there when it comes to human beings. English Setters can't be left alone for too long without becoming destructive, and any withdrawal of affection--including harsh language--can seriously upset the English Setter. If affection is given, though, the English Setter can be a funny, energetic, and engagingcompanion, noted for its "clownish" demeanor. Setters are extremely good with children. These Setters are not quite so good with other animals, and old hunting instincts can sometimes take over. It's important to train your Setter early in order to socialize it to other household pets, and to help make your Setter more manageable during outdoor exercise.